We always try to go for a walk on New Year’s Day. It is usually quite brisk. This year we stayed local and walked from home, just a short way onto the moor above our village. This moorland has an interesting history, much of it hidden. There are a couple of despoiled long barrows from the bronze age. A monument to Queen Victoria’s jubilee year. Two millstone grit quarries, where building stone was extracted for local buildings, including, presumably, the one in which we live. “When I was a lad”, as we like to say around here, the moor had been recently grazed by sheep and was mostly heather, or ling (useful for thatching and for raising grouse for sport), with some bracken and small areas of trees, not big enough to call woodland. During the last 50 years the wood has been steadily marching over the moor, unbrowsed by sheep. It is a mini study in colonisation by those cunning ancient earth dwellers – trees. This post is a pictorial (Eh, that’s not really anything different then – Ed) check on how that progress is going. 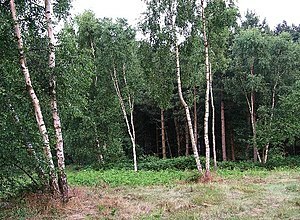 These guys start the assault – silver birches (OK there’s a sycamore or three in there too). They must have started their invasion about 50-70 years ago, my Mum and Dad used to pick their favourites when they were out walking in courtship before the Second World War. This picture shows a dell we really like, a stream runs through the middle and it is mostly silver birches. You could sleep out here, or have a picnic. The trees have shaded the ground for so long that the heather and bracken have given up and grass is prevailing. Look at the trunk (stem) on this one – you can easily tell we’ve had a really wet 2012 (Well it was a bit dry in March) – look at he green of the moss. So, the silver birches started the colonization quickly followed by these fellows. This is a mountain ash, as we call them (Rubbish picture – Ed. Well at least you can see all the rubbish bracken and that’s about all there is to see where there’re no trees – FS). They have no close relationship to the real ashes, except that they have a similar leaf form, so they will not suffer the dread fate of chalara fraxinea or ash die back – more of this in 2013 and for a couple of decades to come. My father hated this tree as it produces it’s bright red berries really early in autumn, presaging the cold Winter days to come (he worked out of doors). OK, fast forward, and today the oak is establishing itself widely on our moor. The pictures should tell the story, but they need a little help. They start small. Oaks don’t appear on their own, they are helped by squirrels (wash your mouth out) and jays burying acorns and forgetting where they are – apparently jays are the best at this. In Winter, unlike their parents, they keep their dead leaves on which helps protect buds against frost (it says here). This makes them really easy to spot in Winter. Below’s one open to the vicious blast of our prevailing West Wind, you can perhaps see how the leaves have been ripped off windward, but preserved leeward, and how the growth of the tree has been affected. If the sapling grows in a sheltered position the formation of the tree is much more even. This one is atop one of the stone quarries and therefore a bit exposed, but it seems to be coping well. See those serried ranks of silver birch in the distance. As I look forward to 2213 I am happy that there is a good chance of oak trees like these coming to adulthood and producing much of value to whoever walks the moor in those days to come. This entry was posted in Days off and tagged ash, oak, silver birch, sycamore, woodland by Flying Shavings. Bookmark the permalink.